Nestled in the northeast part of Kansas is Lawrence, a city known for its iconic main street, Massachusetts Street. Massachusetts Street, known to locals as Mass Street, or Mass, is a top destination for Kansas travelers on TripAdvisor. Mass is listed on the National Register of Historic Places and most of the buildings were constructed between 1856 and 1953. 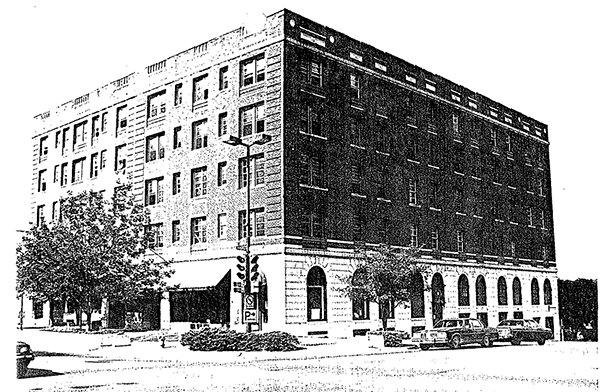 One of the most prominent of these constructions is the Eldridge hotel. The Eldridge was built in the mid-1800s by an anti-slavery leader, Shalor Eldridge. It was built three stories high and had 50 apartments. It’s style is reminiscent of the Beaux Arts movement because it utilizes formal symmetry. Common features of this style of architecture include flat roofs, facades with emphasis on symmetry, large size and scale and roof line balustrades. Some visitors believe the property is still haunted by Shalor Eldridge. The building’s original cornerstone is in room 506 which some say is where he lives. The Liberty Hall is another Mass landmark that now hosts theater and musical acts. It also has elements of Beaux Arts style including brick pilasters, arched windows, opulent interiors and grand decorative elements.